On of the great things about embedded computing is that it lets you measure all sorts of fun things. By taking programming out into the "real world" it becomes much more engaging, but then we bring it back home and display it on a screen and it all gets a bit dull again. What if we could display our results in a physical fashion? I just got hold of 1m of SMRT Pixels from Embedded Adventures. These are basically the same as AdaFruit NeoPixels as they're both based on the WS2812B chip/led system. NeoPixels are tricolour LED's, but what makes them special is that they have a controller embedded on each one which allows you connect them together in a chain, and control any number with a single control pin. The colour of each of the 30 LED's in my 1m strip can be individually controlled! The way these works makes them very tricky to program, as the timing has to be accurate to about a micro-second. This is hard on a 16Mhz Arduino, and even harder on a Pi as its got a whole load of other code running on it at the same time. Fortunatly AdaFruit have some good Arduino code, so I took that and wrapped it into a Sniff "neoPixel" device - currently Arduino only. The string of pixels is connected to pin 3, and the colour of the pixels is controlled by two lists - neoColor and neoShade. These follow the Scratch pen colour model, that the newColor list sets the Hue, while the Shade controls brightness. We're not worried about brightness, so I've ignored the neoShade list - if you don't add entries to that list it assumes the default value of 50 (0 is black, 100 is white, 50 is a fully saturated colour). The neoColor list is filled in with values from 0 to 120, which is 1/3 of the way round the colour circle from Red to Green. 360 takes us all the way back through blue and back to red again (Scratch uses a value of 200 but 360 makes far more sense!). Of course the obvious thing to do is produce lots of cool animated patterns - which of course I did, but there's plenty of other fun things you could do to visualise data using these: you could make a Pie Chart (or what ever a linear Pie chart is called? ), you could move dots at specific speeds, you could make a giant thermometer. You can of course cut these into shorter strips, so you could make a digital abacus, or a clock face, or any number of cool things (I've got a totally insane project in mind for these, but thats for another day!). I filled the strip with red to green rather than a full spectrum for a specific reason... because we're going to sort them, and red to green has a clear "order". Sorting is a classic computer science problem, and it usually involves lists of numbers. 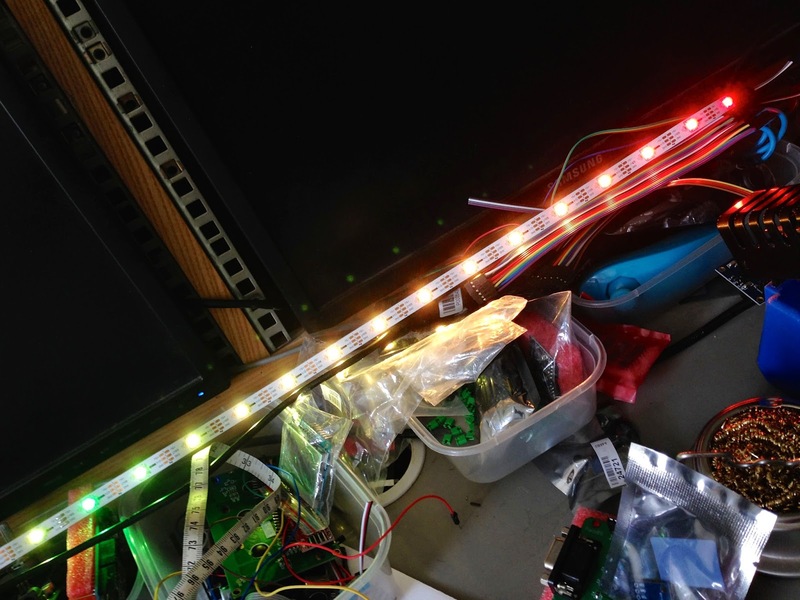 The SMRT/NeoPixel strip makes in physical! Rather than some abstract values, the colours actually mean something, and we need to "repair the rainbow!". The best way to make a messed up list is to start with a good list, then pick random pairs and swap them over. If you think it would be better to just generate a list of random numbers, feel free to read up on low discrepancy sequences, then come back and do it my way... (actually its not really a big deal here, but something like a Halton Sequence is far better than random numbers for lots of applications - but I digress). showNoSwap does the same, but leaves them back where they started, so we can show they were compared at but not swapped. You probably want to adjust the timings to slow things down (unless you're trying to make the whole demo fit in a six second video). And finally we're ready to sort the list, using a bubble sort. A bubble sort compares the first two items, and if they're in the wrong order its swaps them. It then compares the second and third, and so on until it reaches the end of the list. If you repeat that enough times, then the list ends up sorted (enough times being some unknown number less than or equal to the number of elements in the list). The code is tested on a standard 16Mhz Arduino, but should support a variety of AVR speeds, and the Due ARM board. If you try it on any other boards, then let me know how you get on. One of the fun things you can do on the Leonardo and Yun boards is send "HID" messages over USB to a computer. HID stands for "Human Interface Devce", and basically means any kind of Joystick, Trackpad, Mouse or Keyboard. While this features main application appears to be practical jokes, such as moving someones mouse randomly, or logging them out at unexpected times, it can actually be useful. One thing you can easily do is hook up a wii nunchuck controller and pretend its a mouse - handy if you have to stand at the front of a room demoing some software in front of a projector, and don't want to be tied to a desk. Similar "Air Mouse" devices are available commercially, but building one yourself is far more fun, and totally configurable (and its cheaper even if you buy all the parts especially for the project - you can get a Leo + wii nunchuck for less than $10 on ebay). Lets start with the nun-chuck: It turns out Nintendo used i2c to communicate between the Wii and the Nunchuck controller, so you can just cut the Wii connector off a cheap controller and solder on some pins to connect it to an Arduino. Unfortunately you may not know what each wire does! You can figure it out pretty easily with a multimeter, or you can by an adapter on ebay which plugs into the Wii plug and breaks out the pins. I took the middle route - I bought an adapter, got it working, then used the adapter to help me find the correct wires. OK that's a lot of lines, but actually that's just because the Wii controller collects a lot of data! For a couple of dollars you get a Joystick, two buttons and an accelerometer. Each time we call read on the nunChuck device it updates all of these values. I first mapped the Joystick position to the mouse movement. Of course you could also use the accelerometer. You can also play with the scaling and timing to adjust the speed of the mouse pointer. Once we've decided how much to move the mouse pointer just 'tell fakeMouse to "move"'. Simlarly I mapped the two wii buttons to left and right click. Currently the fakeMouse device restricts mouse actions to clicks rather than up/down so that there's always a valid up/down->click pairing, rather than potentially sending a down, and forgetting to send an up. This could be changed - feedback is always appreciated. And that's it - plug it together, double click the leo/yun reset button, then run leo-sniff (yun-sniff). Occasionally the code downloaded into a yun/leo doesn't start running immediately, so if it doesn't work, hit reset once more. Downloading is a bit more fiddly with these Arduinos - unfortunately its known problem that happens even when you're running the official Arduino software. There's lots more you could do with this - you could map the accelerometer the mouse movement, and use the joystick for send pre-defined key presses, for example to move forwards and backwards through a presentation. You could even add some buttons and a screen to the Arduino, to select different configurations, or maybe even automatically type predefined messages. After putting if off for a while in favour of building rc-cars and hot wheels test track, the Sniff Beta 6 release is now available from the Downloads page. Looking at release notes it doesn't look like there's much there, but Arduino Yun and Leo support is actually pretty huge. These boards handle USB on the main processor, which means they can pretend to be a mouse or a keyboard (Wii mouse anyone?). Remember to include the usb and usbConsole devices if you want to be able to print stuff out the host computer! The downside to this flexibility is that you have less memory left for your code (as about 6.5K is used up by the USB stuff), and programming is a little more tricky, so stick with the Uno over the Leo unless you need these features. The Yun however is a different beast - it runs Linux on one processor, and has regular (ish) Arduino piggybacked on. This means you either communicate with it like a Leo, or use the Unix side to access it via the network. The Yun-upload script lets you send a compiled Sniff program to the Yun over the network. Your Sniff program can also talk to the Linux processor using the Bridge device. This doesn't yet support the full range of services in the Arduino Bridge library, but allows you to use the bridgeConsole to access text i/o over the network (check the examples and manual for more info - YES there's a manual!!). Arduino bridge also supports keystore access. This is a great feature of the Yun that's massively under documented in the Arduino world. Using the bridgeKeystore device, you can use the variables bridgeKey, and bridgeValue to put and get values into a dictionary that's held on the Linux side of the Yun. Most crucially you can access this store from elsewhere on the network using http. Just access the URL: arduino.local.//data/get or arduino.local.//data/get/keyname to fetch values, and arduino.local.//data/put/keyName/newValue to change them. For example you could use this to fetch values from a sensor, or send values to a controller, without having to write any significant networking code. Elsewhere there's also support for i2c lcd displays, and the lpd8008 device is now included. Other new examples include code for PiBot, Pibrella, 7Seg, and the Hot Wheels demo. I've been wanting to build some kind of speed trap experiment for ages, and today I finally built it, and it worked out great - total component costs less than $1 to answer the question that every five year old boy, and everyone who's ever been a five year old boy wants answered: Could Lightning McQueen beat the Batmobile in a straight race? To answer this, we need to build a speed trap to measure their top speed. As speed is just distance divided by time, the easiest way to do that is to trigger something at one point on the track to start a timer, and then trigger further along the track to stop the timer. We can measure the distance, divide it by the measured time and we've got our answer! There are bunch of different triggers we could use but by far the best is a light dependant resistor. These cost pennies, and I had a bag of 20 or so, so I melted a couple of holes at each end of a piece of hot wheels track and put an LDR in each. The LDR has a low resistance when there's light shining on it, and a higher resistance when not. The ones I had measured around 10Kohms so I wired the LDR at the top of the track between 5V and Arduino A0, and a 10K resistor from A0 to 0V. I repeated this at the other end of the track with Arduino A1 to stop stop the measurement. I also used an LCD Shield for display and a Sensor Shield to make hooking this up easier, but they're strictly optional. ..set message to "Hot Wheels Speed Trap"
First thing the code does is create an LCD device and two analog inputs. To calibrate the system we need to measure the distance between the sensors, and for a standard piece of hot wheels track it turns out that they end up exactly 30cm apart. Then we display a "ready..." message on the LCD. Now we just wait for the start gate to be triggered. The value of 0.5 might need a bit of tweaking depending on your lighting conditions and components, but for me using a 10K resistor in a normally lit room, 0.5 worked pretty reliably. to give a runing timer through the speed trap. However over a single track piece removing this improves accuracy, and you couldn't really see it any way. ..set message to "time :"
..set message to "speed (m/s):"
Now we just calculate the elapsed time, and speed. Of course this is in metres per second, so multiplying by 3.6 gives kilometres per hour. ..set message to "speed (kph):"
So what to the results tell us? Well both cars clocked in at 0.10 seconds for the 30cm distance, giving a speed of 3m/s or around 11km/h when run down a ramp about 1m high. That's a potential energy (mgh) of 10m (where m is the mass of the car, h is the height and g is gravity which I'm calling 10 cause its close enough). That gets turned into kinetic energy(1/2 mv^2) or about 5m (1/2m*3*3 - I'm rounding up again!). That's actually pretty good as there's a lot of friction to be dealt with and we're turning the car through 90 degrees as it wants to drop down, but we push it forwards, so 50% efficient isn't at all bad. The best we could hope for on this track is about 4.5m/s or 16km/h. There's lots more you can do with this - different cars, different heights, different shapes of tracks. My money's on this guy - on the ground he only does 0.1kph but on the way to Mars he clocked in at around 21,000kph! Some time ago I picked up a couple of LPD-8008 displays from Embedded Adventures. Each display is made up of ten of the 8x8 LED matrices that are often hooked up to Arduino and Pi's. That's 64 pixels per matrix,or 128 LEDs (as they're tricolour),making 1280 LED's per panel. Hooking up two panels makes a crazy 2560 LED's. Half the time, when you buy stuff like this, half the problem of making it work is figuring out exactly what you have - but in this case the documentation is excellent. One thing it warns about when hooking up these panels is that this many LED's can use a lot of power. If you try turning on all of the LED's at the same time, then you need 2.5A (@5V=12.5W) per panel. What this means is that you shouldn't be running it of the internal power regulator of your Pi or Arduino... In practise you'll just about get away with it for displaying text as most of the pixels are off most of the time, so power consumption is a lot lower . However I did overload the Arduino power supply several times during development so I wouldn't recommend it - particularly on a Pi where reseting the PSU is far more serious than an Arduino. To get these working in Sniff, I wrote a new lpd8008 device extension. While it would be possible to drive the whole thing from Sniff, writing an extension hides the internals, and makes it easy to use complex devices with only a few lines of code. The heavy lifting is done by the extension which consists of the two files Xlpd8008.h and Xlpd8008.c. Placing these in the Sniff lib directory automatically adds the device into your Sniff system. You can check this in C file, as it might change in future (there are also pins declared for Raspberry Pi). Hooking up multiple displays is simply a matter of daisy changing them together with a ribbon cable! .set message to "Hello World!" We start by making an lpd8008 device, but as I'm using two hooked together I tell it to use 160 columns (rather than the default 80). The device supports a single command "tick" - which updates one row of the display. The first script is set up to constantly call this function, so that the whole display is active. In the second script we simply set the variable message, which contains the string to be displayed. This also sets the colour to green (1=red, 2=green, 3=orange). The files will be included in the next Sniff release, but in the mean time you can download and install them into your current Sniff system: Download. They've been developed and tested on Arduino, but should work fine on Pi too. Personally I'm looking forward to hooking this up to a Punchthough Bean, and displaying my phone notifications on it! @code_ED and I had a bit of a catch up last week, and he leant me a few toys to play with - an Arduino Yun and one of his PiBots (http://raspberryfool.net). I'll save the Yun to talk about another day, but the PiBot works great with Sniff. The PiBot consist of two tracked sets of wheels, driven from a board which handles the electrical side of things, including providing battery power to the Pi. Driving it from Sniff is pretty easy (once I'd figured out that the sample Python code used Pi header pin numbers rather than broadcom gpio pin numbers). slightly counterintuitivly, sending left forwards, means you're turning right! However while this works fine, and is a really good way to get started I wanted to do something more fun. To get the PiBot to move more smoothly we need to be able to set the speed of the motors. We would do this by changing the voltage supplied to them. Unfortunately the PiBot can't do that, but what if we turned the motors on and off really fast - like 1000 times a second. If they were on for half the time, and off for half the time, then it would look like they were running at half speed (in fact they probably are because the motors probably take longer than that to stop or start). This is exactly the trick the Arduino uses when we use an analog output as the Arduino's AVR chip has hardware specifically to do that, but the Pi's GPIO can't do that either. But as I've worked with Sniff I've found that its surprisingly good at doing stuff like that. It's not really designed for high speed low level IO, but it seems work. We have a number "leftSpeed" which is going to go from -1 to +1. -1 is full speed backwards, while +1 is full speed forwards. I'm sure there's a more elegant way to do this, but we handle forwards and backwards separately. If we're going forwards then we turn the left motor on for a fraction of a millisecond, then off for the rest of the millisecond. The longer that fraction then the more power goes to the motor, and the faster it goes. Same for backwards, and the same for the right track. Just set leftSpeed and rightSpeed to the values you want, and off it goes! Of course the real irony is that the PiBot board includes an AVRTiny processor to handle the kill switch. Sniff works great on AVRTiny processors - with a bit of tweaking to allow reprogramming, the PiBot board could run all this stuff itself, and it wouldn't even need the Pi!